Garden State Parkway Southbound - Take exit 67 onto County Rt. 554 West, merge onto Rt. 72 West. Make left at traffic light onto County Rt. 539 South for approximately four miles into the town of Warren Grove. Make a right onto Simm Place Road and a right onto Beaver Dam Road. Warren Grove RA is approximately one mile ahead. Garden State Parkway Northbound - Take exit 58 onto County Rt. 539 North approximately 6 miles into the town of Warren Grove. Make a left onto Simm Place Road and a right onto Beaver Dam Road. Warren Grove RA is approximately one mile ahead. Warren Grove Recreation Area is an undeveloped wilderness perfect for hiking and birding. This 617-acre parcel is just west of the town of Warren Grove and straddles Ocean and Burlington counties. The land was acquired from the National Park Service in 1972 as part of their Federal Lands to Parks Program. Bass River State Forest administers this area. Through the Carry-In/Carry-Out Program you can help us keep the forests clean and beautiful by carrying out the trash you carry in. Thank you for your cooperation and remember to recycle. Warren Grove Recreation Area is open for passive recreation including horseback riding, bicycle riding, hiking, birding, hunting and nature/ecology study. A small parking area is being planned along Beaver Dam Road across from the Federal Aviation Administration’s tower site. Access into the recreation area is via several sand roads and old woods roads through the area but no marked trails currently exist. The recreation area also is home to the federally endangered broom crowberry (Corema conradii) and other rare plant species. View the Dwarf Pine Plains habitat, a globally rare forest community, where the pitch pine trees reach an average height of only 4 to 5 feet. The central region of the Pine Barrens contains several areas of pine and oak forest that resemble the surrounding forests with one major exception: from a standing position, one can gaze over the top of the tree canopy. The Pine Barren Plains, known locally as the Pygmy Forest, contains trees that may attain a height of only about four feet at maturity. New Jersey contains the world's largest acreage of this globally rare forest community, which can be seen within portions of Warren Grove Recreation Area. 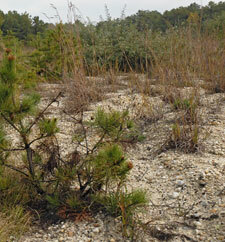 Many researchers believe that this unique stunted forest ecosystem is partly the result of the fire ecology of the Pinelands.